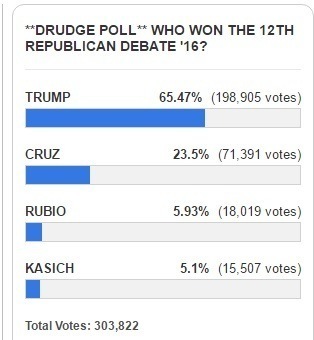 Cruz supporter spammed the Drudge Report on Thursday night during the CNN GOP Debate to rig the popular website’s online poll. All of the Cruz spam came from Delaware. Matt Drudge tweeted this out late last night. Here’s a look at the numbers early Thursday night during the debate before the cheating was discovered. By Friday morning the numbers were corrected and Donald Trump was the clear winner.